The Artistry of Conductor James Levine The music director of the Boston Symphony Orchestra may be the finest American conductor since Leonard Bernstein. After conducting the Metropolitan Opera for 34 years, James Levine took over the BSO from Seiji Ozawa last year. The music director of the Boston Symphony Orchestra may be the finest American conductor since Leonard Bernstein. After conducting the Metropolitan Opera for 34 years, James Levine took over the BSO from Seiji Ozawa last year. James Levine with members of the Boston Symphony Orchestra. When James Levine was appointed music director at the Boston Symphony last year to succeed Seiji Ozawa, one critic likened it to Babe Ruth coming back to Boston. After all, Boston is a city that's sensitive about finishing behind New York. 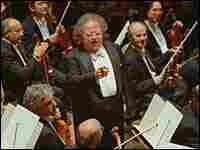 James Levine is widely considered the most accomplished American conductor since Leonard Bernstein. While many of America's leading symphony orchestras struggle with large deficits and declining ticket sales, the Boston Symphony Orchestra thrives. That's why James Levine is here. On a stage at Boston's Ornatal Symphony Hall(ph), a short man with a large cloud of frizzy hair settles onto a specially designed conducting chair and raises the baton. It's a three-hour rehearsal that begins with a work the musicians must have played countless times: Gustav Mahler's 4th Symphony. SIMON: This is James Levine's second season at the Boston Symphony. He's considered to have given a jolt of energy and daring to one of the country's oldest and most esteemed orchestras. Richard Dyer is music critic at The Boston Globe. Mr. RICHARD DYRE (The Boston Globe): There's no question in anybody's mind that I'm aware of that they are playing more consistently and more--living more dangerously. SIMON: The BSO may be able to afford to live a little more dangerously than other orchestras. It has the largest operating budget of any major orchestra in the country, $74 million, and a $320 million endowment. The orchestra's managing director, Mark Volpe, finds it fitting that his orchestra sits just across the Charles River from Harvard, the country's best endowed university. He believes that Boston's happy accumulation of capital enables his orchestra to take chances, even challenge its audiences. Mr. MARK VOLPE (Boston Symphony Orchestra's Managing Director): More contrarian in a period where a lot of orchestras are getting more conservative. We're saying, no, we're not going to get more conservative. We're going to invest in the content. SIMON: James Levine has invested in new content for his venerable old Boston institution by commissioning contemporary composers, including Elliott Carter, Jonathan Dodd and Peter Lieberson. The day we visited, the orchestra was rehearsing Mr. Lieberson's "Neruda Songs," a composition inspired by the poetry of Pablo Neruda. SIMON: Mr. Levine has rarely been able to commission a new work during the 34 years he's been conductor of New York's Metropolitan Opera, a position he still holds. The chance to play new music in Boston excites and energizes him. Mr. JAMES LEVINE (Boston Symphony Orchestra Director): It just seems obvious that people have always written music and continue to write music, and the repertoire is always revitalizing itself. Mr. LEVINE: Yes, you see, for me, planning the programs is one of the most important aspects because what one wants is to introduce the audience to new pieces. But, I mean, there are always some people who treat learning about or digesting new art as though it was something very akin to World War III, you know, something--and this always amazes me because I keep thinking surely most people have the spirit to be interested, to give it a chance based on the fact that it can't be absorbed in just one hearing; very little music that's any good can be. I'm always urging audience members to hear the piece again because if you go a day later or a month later and hear the piece again, certain things strike you that you literally didn't hear the first time. Mr. LEVINE: This you just can't do. The orchestra can't get close enough to most significant new pieces without a little advance work. SIMON: The musicians accepted that argument as musicians more than labor union members. James Somerville is the BSO's principal horn player. Mr. JAMES SOMERVILLE (Boston Symphony Orchestra): I wouldn't go so far as to say everyone's thrilled about the extra work, but I don't think very many people are really unhappy. I mean, there's a bit of grumbling, but I think the results are what's important, and I think pretty much everyone really feels those results. SIMON: Levine also makes certain that the clocks on stage and in the concert hall are covered during rehearsal so that the musicians aren't averting their eyes to count down the minutes to the end, though he hasn't barred them from wearing wristwatches. James Levine says he's always looking for new compositions. Mr. LEVINE: I find them every way. I find them by sitting, having a meeting or a lunch or a drink or something with any one of a number of colleagues, composers, conductors, instrumentalists. And I say to them, `What have you played lately that was new that you liked or that was interesting?' And I'm always kind of working on new scores just as a matter of course, just to reduce the number of things that I have no knowledge of. SIMON: Which cannot be many, at least in the world of music. 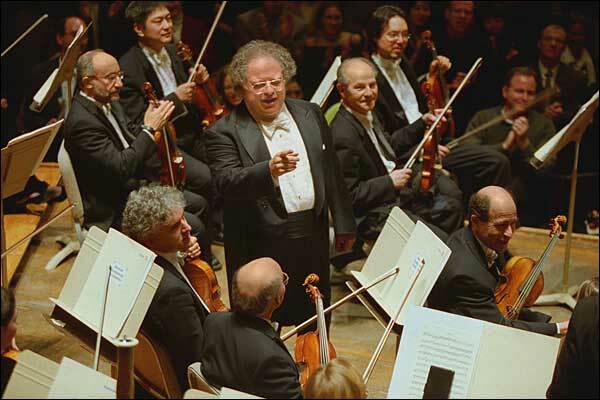 James Levine is now 62 years old. He was born and raised in Cincinnati where he made his debut as a piano soloist with the Cincinnati Symphony Orchestra at the age of 10. He was assistant conductor by the time he was 21, the youngest in the orchestra's history, and also led the Chicago Symphony Orchestra's Ravinia Festival for 20 summers and has guest conducted and made recordings with most of the world's leading orchestras. Music has been in his life, has been his life almost since birth. I've been told that--What was it?--your parents put a record player near your crib? Mr. LEVINE: Yeah. Sometimes when they needed peace and quiet in the house after I was born, they put a small record player that I could handle with a stack of records next to it. It was one of many things that they tell me, that I sang melody coherently before I could really talk coherently. I had a speech impediment and my mother was speaking to the pediatrician, and the pediatrician said, `Well, what's he interested in?' And my mother said, `Well, he drives us crazy banging on the piano all the time, reaching up to it when he's nearby.' And the doctor said, `Well, try piano lessons.' Perceptive doctor. SIMON: This is the maestro himself playing Gershwin's "Rhapsody in Blue" at the Chicago Symphony. Another interest he has in Boston is trying to make new links between different composers and musical styles. He's programmed a series of concerts that pairs Ludwig van Beethoven with Arnold Schonberg, two German composers who were separated by a century. Mr. Levine believes you can hear a common musical approach beginning with Beethoven's 2nd Symphony. Mr.LEVINE: People didn't know what to make of a movement like the finale of that piece, with all its stops and starts and all its harmonic permutations and all its jagged energy. And I think most of the German-oriented composers who followed him did not really use that aspect of his writing very much. I think that what happened is years later, Schonberg came along and somehow made an extraordinary contact. Mr. LEVINE: I thought, `Maybe if I put these pieces together a certain way, it would make a little more logical in the ear and the mind of the listener what Schonberg was doing, but it would also light up the Beethoven works in a different way. SIMON: The BSO's previous conductor Seiji Ozawa was a famously energetic stage performer, jumping and gesturing along with the music. James Levine is, well, quite a contrast, sitting still, moving his baton subtly, fluidly, almost discreetly. Mr. LEVINE: This was a gradual thing for me. I started off fairly gestural, but I've tried to make myself obsolete in the performance. I don't like the audience to have to go through a middle man interpreting what the piece is expressively by his gesture. To take a simple example, if I want the orchestra to come in uniformly loud and sustained, and I make a huge upbeat, maybe the sound when it comes out is more than the audience expected or less than the audience expected. But the point is it's killed either way because the audience expects it because they saw the upbeat. SIMON: And principal horn player James Somerville says that Mr. Levine's minimal movement can have maximum effect. Mr. SOMERVILLE: He can give one little gesture and it suddenly can be very, very meaningful. I can give an example--this past summer when we played all the Brahms symphonies at Tanglewood. And there's a moment in the finale of the 1st symphony where there's a big horn solo. It's a very dramatic moment in the piece, sun coming out and outpouring in the mountains and it had been fine in rehearsals. And then in the concert, I looked up right before, and he just kind of like his eyes opened a little wider than they had and his hands opened up a little wider than they had. And it was almost without even processing it, I played it quite differently, and I think a lot more openly and frankly a little better than I had. Mr. LEVINE: I give them all the things that they would need to feel the shape from the rehearsal and to deal technically with, say, the people on this end of the pit who can't hear so well, the ones on that end. For this, they need to see. But the school that thinks somehow that the gesture excites the audience so they can follow visually--that's not the sort of experience that they're supposed to be having. And there are very little oral media left that aren't mixed up now with visual ones. And I fight it because I think everybody has bigger and bigger ears and less eyes and less discerning ears. SIMON: But there are other reasons why James Levine conducts from a chair. He's had health problems and has had to take time off from conducting. Back problems have made him begin to conduct a sitting position at the Metropolitan Opera where performances can endure up to five hours. Mr. LEVINE: I found that if I could sit and stand when I wanted to, then I could spare the back. And it's in a phase now where when I sit down in the chair, I feel my whole conducting mechanism levitates and I feel wonderful; whereas, if I stand, I get eventually preoccupied with trying to relax my legs and the lower back, and it's distracting. SIMON: I guess I don't have to tell you there are some people who are concerned about your health. SIMON: Because it has something to do with your stewardship of this great orchestra. Can we put this plainly how you're feeling? Mr. LEVINE: Yeah, I'm feeling very well. I mean, I've been working to try to determine what's the best pace, and I love it when I'm really working hard and on diverse projects, but I find the difference is now I can hear a little voice saying, `I need five days free.' Or I need, you know, not to have to conduct for a week. And I have two chronic ailments that I've had for years. One is this sciatica which comes and goes. The other is I have in my left arm, intermittent tremor, but everyone--all the doctors, etc., all encourage me to conduct like always, but to take the little breaks more often. And this, I think, works. But some days you might see the tremor and other days not. And that's how it's always been. SIMON: Without putting you on the spot, I've been told you don't have a lot of hobbies, that music is your life. Mr. LEVINE: Oh, the way I think of it, I guess, is that everything I do goes into ultimately the big main river of my life which is music. I guess there's also learning new music. I mean, I'm always going on vacation with a handful of scores that are not what I have to do right then because for me vacation from music means not having to rehearse or perform. But I wouldn't know what to do with myself all day, day after day, if there weren't some part of the day where I can explore the scores that I have with me. SIMON: It might seem boorish to speak so openly about something that is personal as a man's health and equilibrium, but the musicians around James Levine do because they all share an investment in his future. They're hoping that Mr. Levine's time in what he's made his conductor's chair in Boston won't be just a brief episode, but an era. Our story was produced by Brigid McCarthy and recorded by Daniel Shuken(ph). The composer Arnold Schonberg's nationality is misidentified in the audio for this story. He was born in Austria.